French Open 2017: Rafael Nadal threatens chair umpire, says he will "never chair his match again"
Top hope for the French Open 2017 and former World No. 1 Rafael Nadal yesterday demolished compatriot Roberto Bautista Agut in straight sets – 6-1, 6-2, 6-2 and may have had no trouble there. Although Ramos took only 5 games in the entire match, Nadal was still unhappy during play, specifically with the chair umpire Carlos Ramos. Nadal took a significant amount of time between games and a lot of time to start serve. This prompted umpire Carlos Ramos to issue a warning to Nadal, something that did not go down well with the 9-time French Open winner. "You will have to give me a lot of warnings during this game. Give me the warnings you can because you will not referee me any more ," he told Ramos at the end of the match. Nadal has been disciplined for time violations before, most famously by chair umpire Carlos Bernardes. Following a 2015 dispute in Rio between the pair, which was also for time violations between serves, Nadal made a special request to the ATP, asking for Bernardes to be barred from umpiring any of Nadal’s matches. Although uncommon, the ATP acceded to Nadal’s request; perhaps Nadal will make that same request again with regard to Ramos. 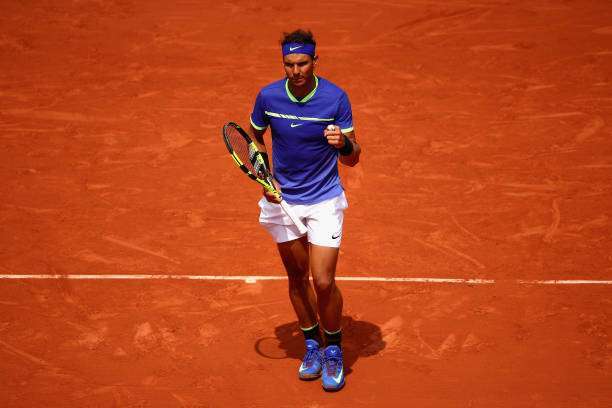 Nadal is gunning this year for a tenth title at the French Open – dubbed ‘La Decima’ by fans. That would extend Nadal’s already seemingly unsurmountable record and further cement his standing as the ‘King of Clay’, with no other player as successful on the surface as Nadal has been, at Slams or otherwise. Following a quarter-final clash with compatriot Pablo Carreno Busta – who upset Milos Raonic this week, Nadal will take on World No. 2 Novak Djokovic in the semi finals – who only slightly leads the pair’s head-to-head record at 26-24 – in the quarter-finals in what promises to be a big clash. Although one might give this one to Nadal purely on the basis of form and fitness – two things Djokovic has had a few problems with, the Serbian ace appears to be en route to a big return of form – and that might well translate into an upset of Nadal. While I am still inclined to give this one to Rafael Nadal – given that the magnitude of his wins has been far more significant than those of Djokovic, the World No. 2 is still one of the most successful clay court players in the sport. He has also had quite the return to his previous aggressive form lately, so this could be an upset. Even if it’s not an upset, this match is sure to be one that goes down to the wire – so a great watch for fans either way.